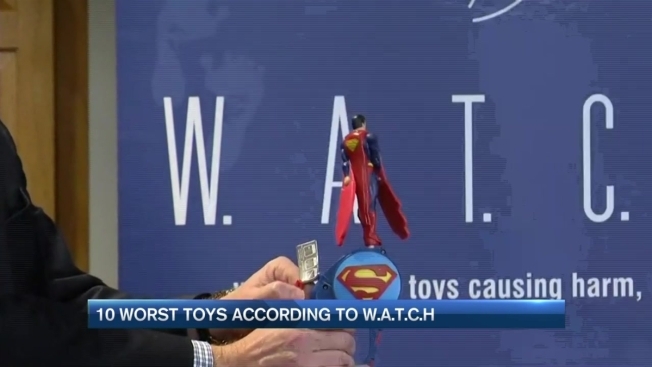 W.A.T.C.H., or the World Against Toys Causing Harm, has announced its 44th annual list of the "10 Worst Toys" for this holiday season. Each year, the toy hazard-monitoring nonprofit reveals a list of potentially dangerous toys. "Due to poor design, manufacturing and marketing practices, there are toys available for purchase today with the potential to lead to serious injury and even death," the organization wrote in a press release. "W.A.T.C.H. urges parents and caregivers to take precautions when buying toys -- especially during the upcoming 2016 holiday season, which accounts for more than 65 percent of all toy sales." According to W.A.T.C.H., the small parts in the set pose a choking hazard. And while some sets have an age recommendation of 3 and up with a warning, "other packages of what appear to be the same toys are sold for oral-age children as young as '2+' with no warnings about toy-related hazards." This slingshot-like toy that can shoot balls of slime "over 30 feet" could cause eye injuries, according to W.A.T.C.H. This product, designed for children 4-12, is worn "for a bumpin' bump 'em' fun time!" Kids wearing the suit and bumping into each other should wear protective equipment, the warning label says, but none is included. W.A.T.C.H. says it could cause impact injuries. To put Butch into action with "galloping action and sounds," children must push a button on his tail, which W.A.T.C.H. says could cause puncture injuries. The cord on this toy is about 31 inches, according to W.A.T.C.H., posing a risk of strangulation. W.A.T.C.H. says this toy, which encourages children as young as 4 to "rip it" and "rip it," could injure their eyes and faces. The toy warns users to launch Superman "at arm's length and pointing up and away from your face." W.A.T.C.H. voices concern that despite the package warning about a choking hazard, "the manufacturer offers no warnings regarding potential impact injuries associated with foeseeable use of the heavy, rigid plastic battle hammer."